The MODTRAN® (MODerate resolution atmospheric TRANsmission) computer code is used worldwide by research scientists in government agencies, commercial organizations, and educational institutions for the prediction and analysis of optical measurements through the atmosphere. MODTRAN was developed, and continues to be maintained through a longstanding collaboration, between Spectral Sciences Inc. (SSI) and the Air Force Research Laboratory (AFRL). The code is embedded in many operational and research sensor and data processing systems, particularly those involving the removal of atmospheric effects, commonly referred to as atmospheric correction, in remotely sensed multi- and hyperspectral imaging (MSI and HSI). The MODTRAN software computes line-of-sight (LOS) atmospheric spectral transmittances and radiances over the ultraviolet through long wavelength infrared spectral regime (0 – 50,000 cm-1; > 0.2 μm). The radiation transport (RT) physics within MODTRAN provides accurate and fast methods for modeling stratified, horizontally homogeneous atmospheres. The core of the MODTRAN RT is an atmospheric ‘narrow band model’ algorithm. The atmosphere is modeled via constituent vertical profiles, both molecular and particulate, defined either using built-in models or by user-specified radiosonde or climatology data. The band model provides resolution as fine as 0.2 cm-1 from its 0.1 cm-1 band model. MODTRAN solves the radiative transfer equation including the effects of molecular and particulate absorption/emission and scattering, surface reflections and emission, solar/lunar illumination, and spherical refraction. Physics Upgrade: A line-by-line algorithm to enable higher spectral resolution applications and validation of the band model algorithms. Algorithm Speedup: MODTRAN’s updated algorithms and parallelization techniques can leverage advanced computing architectures to reduce wall clock time. Documentation: A revised user’s manual, an Algorithm Theoretical Basis Document (ATBD) describing the fundamental radiative transfer physics, an Interface Control Document (ICD) to facilitate API implementations, and Robodoc software documentation come with the installation. With a history exceeding 30 years, MODTRAN has been extensively validated, and it serves as the community standard atmospheric band model. 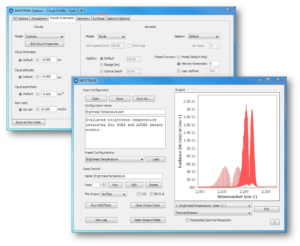 MODTRAN predicts and analyzes optical measurements. MODTRAN6 now includes an extensive Graphical User Interface for easier model development.